Redupax from Sound Seal offers superior, economical performance that ends the “hollow sound” of one of today’s most popular flooring choices. Redupax is available at a much lower cost, and its free-floating design saves installation time. Redupax Underlayment from Impacta Flooring, a division of Sound Seal, is a 100% recycled wood fiber based underlay that will not bounce or flex like many foams, felts, and rubber underlays—resulting in a more stable and robust sound when walked upon, and eliminating the disagreeable “hollow sound” attributed to many floated engineered hardwood and laminate floors. At 9mm thick, Redupax achieves higher IIC ratings than comparable 9-10mm rubber underlayments. It is available at a much lower cost, and its free-floating design saves installation time. 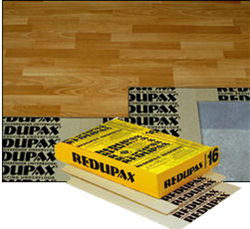 Unlike other floor underlayments on the market today, Redupax Underlayments also offer stability, durability, leveling, and thermal and certified sound performance, all of which combine to ensure significant long-term dependability. Since 1978 Sound Seal has been a leading manufacturer of acoustical noise control products offering the widest product selection in the soundproofing industry with innovative solutions and outstanding customer service. Sound Seal consists of three product divisions: the Industrial Division that deals with in-plant noise control and environmental noise control; the Architectural Division that handles interiors and finishes, including an award winning line of Wood Trends products; and the Impacta Flooring Division that deals with floor underlayments. For more information please visit http://www.soundseal.com or http://www.redupax.com call 1-800-569-1294.